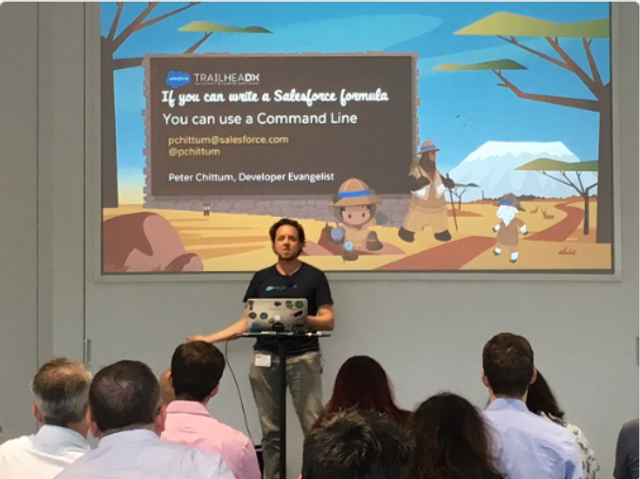 June Salesforce LAUG - Here's What Happened! Last Tuesday, we were generously hosted by Which? for the June Salesforce London Admin User Group. With Salesforce chat and drinks flowing, as well as rooftop views of London, there can't have been many better places to spend the evening for a Salesforce geek, like me! Firstly, we heard from Frazer Lewis on how to build forms in FormAssembly. Frazer offered FormAssembly as an alternative tool to Eventbrite and finds it much easier to use; there were some grumblings amongst the audience at the prospect of data being stored on FormAssembly's server - I'd be interested to hear people's opinion on the 2 tools and their preference. Frazer highly recommended checking out FormAssembly's website for further guidance and the following blog has various tutorials to suit your respective needs. As a very much self-confessed non-techy, I wasn't expecting to understand much of Peter Chittum's talk about Command Lines. However, Peter showed that formula fields and Command Lines are very similar - 'The Command Line is scary is a myth'. Aided by a live demo, Peter showed that learning a few commands can greatly speed up your work process - using Command Lines he was able to search easily, order and count records, modify data etc. If you're able to use Command Lines you can innovate faster leveraging Salesforce DX. You can view Peter's complete slide presentation here. Last, but by no means least, was Richard Barker's presentation on Elements - an Agile Business Analysis application that facilitates a simple approach to documenting your Org. I don't think anyone disagreed that documenting your Org is something all Salesforce Admins should be doing. Richard demonstrated that with Elements you can dispel the 'we don't have time', 'we're agile, there is no point documenting' and 'the consultants will do it/clients won't pay for it' mentalities. Also worth mentioning is their Data Privacy Manager app - more details about this can be found here. Of the many Salesforce Meetups I've attended, I don't think I can recall as much attendee/presenter interaction as this Meetup, demonstrating the benefit of attending such events; having the opportunity to ask questions to like minded peers you might not have access to in your workplace. Outside of the traditional questioning, honourable mentions must go to Rob Arnell, Julia Doctoroff and Cristina Bran - the 3 finalists for the #blazeatrailcontest. Cristina emerged victorious and has won a VIP trip to this year's Dreamforce - enjoy and see you there! On a more sombre note, but an outstanding cause, was Sean Dukes mention of Trinity - a Winchester based charity which supports 600+ people each year who are experiencing homelessness or vulnerability. Sean has been volunteering time to give these people a chance of a better future, developing lifelong skills through Trailhead - he's hopeful of securing one of his members a Salesforce job shortly! In the meantime, if anyone can offer support in terms of volunteering time/IT equipment etc, don't hesitate to get in touch with him. The next Admin Meetup is on Thursday 26th July at Funding Circle, you can sign up here - I look forward to seeing many of you there! July Salesforce LAUG - Here's What Happened! Salesforce and the Retail Industry... a match made in digital transformation heaven.